ErgVideo has seen a bonanza of upgrades for 2015, including the new ErgVideo 4.0 software with Wahoo Kickr and Snap trainers compatibility, and new 1080p HD videos featuring famous climbs and cycling legend Scott Moninger. ErgVideo drops you right into the midst of the action. • Indoors, riding with someone on-screen is a much greater motivator than even the most scenic solo video. • The point-of-view helmet cam embedded in the ride really gives you a sense of being in the pack. It’s the difference in authenticity and adrenaline rush between watching a video from within the peloton versus typical TV coverage from outside the pack. • You are not relying on your own motivation for intervals, often inevitably lacking when riding indoors. Rather, you’re thrust into the middle of a group ride or race and the motivation is built in. Your smart trainer controls your resistance, so all you have to do is ride rather than stare at numbers. 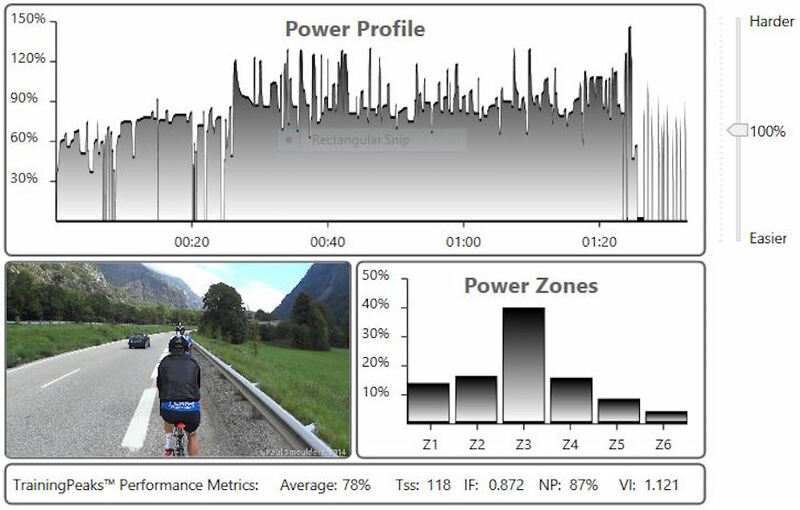 • You can ride the same workout with up to 24 riders on the same computer, and each of you will get the same workout tailored to your individual fitness because it’s all based on your Functional Threshold Power (FTP). • The software is incredibly easy to use and customizable in both workout design and intensity of effort. 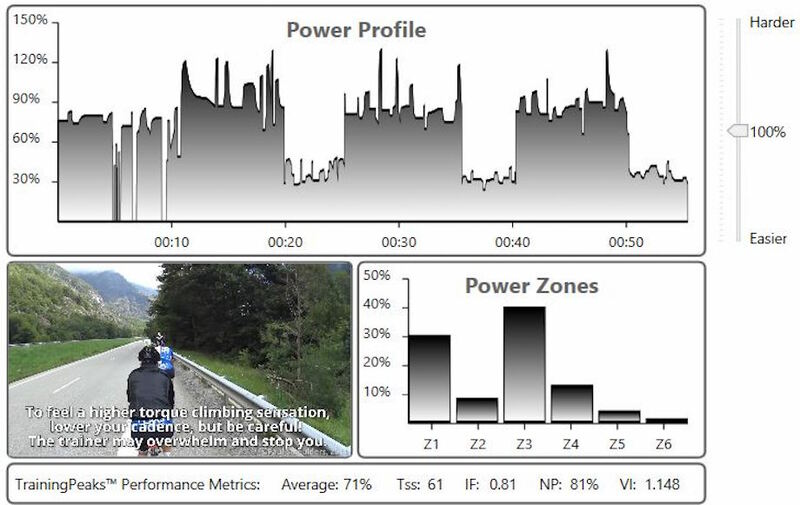 Simply adjusting your FTP will completely alter the intensity and training stimulus of a video. It is also massively powerful and customizable in developing customized rides and training plans very easily. ErgVideo just makes indoor training so much closer to the enjoyment of a real ride than any indoor workout I can do on my own. We have gone over these basics before, so we will instead concentrate on the many new great updates. • ANT+ integration means that almost all ANT+ sensors (power, heart rate, cadence, speed) are now directly compatible with ErgVideo. • Especially for CompuTrainer owners, this means that you are no longer restricted to the heart rate strap and wired cadence sensor specific to CompuTrainer. This makes life a lot easier for taking the bike on and off the trainer. • Even with up to 24 different riders connected to the same ErgVideo workout, only a single ANT+ computer dongle is required to communicate with all the sensors those riders may have. This makes life even easier for indoor cycling studios. 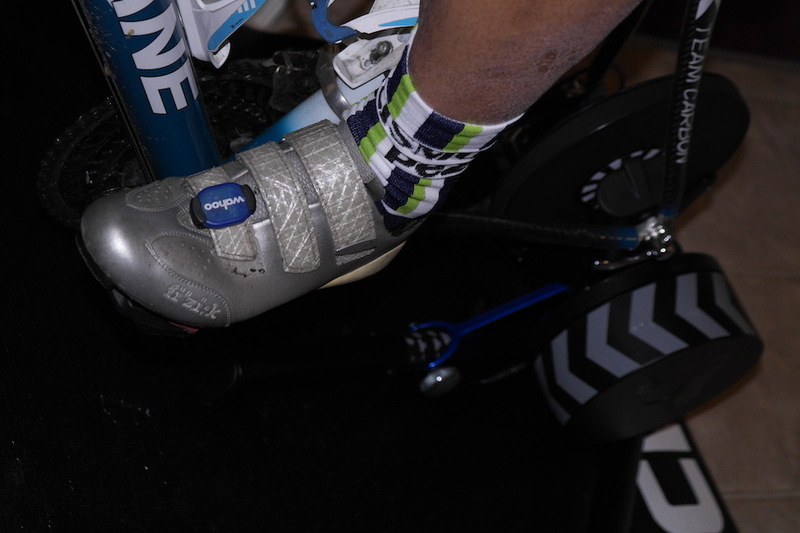 The Wahoo cadence sensor is versatile, and can be placed on your cranks or - even simpler - your shoes. The other advance with ErgVideo this year is their switch from HD (720p) resolution up to 1080p HD. It’s not just a numbers race like it may be with cameras and megapixel counts. I’ve spent the past while alternating between my library of 720p and the new 1080p videos and the quality of the visuals is noticeably crisper and even more lifelike. The relatively stationary (in your view) riders and the background scenery does not see a massive upgrade in resolution. 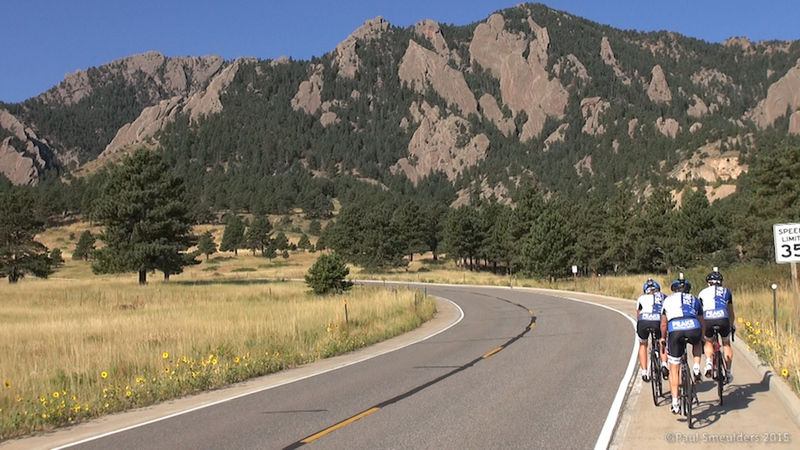 However, the fast moving scenery in the foreground and middle perspective (e.g., the road surface and the grass by the side of the road) zipping by is noticeably more grainy and pixelated in the 720p compared to the new 1080p. And both are a huge upgrade on the non-HD videos in the library. The 1080p HD looks even better in reality than the video here. While this might be nitpicking on a computer monitor, especially with sweat dripping into your eyes, this is definitely noticeable with my using a projector to beam the video to about 80” diagonal against a wall in my training room. To accommodate the 1080p, the file sizes for ErgVideos have ballooned greatly. From the original non-HD videos ranging about 2-4 GB and the HD videos of about 4-6 GB, the new 1080p videos range from 10-15 GB. That means that ErgVideos have switched to a download-only delivery system for all their products, with savings on shipping and also instant availability. What it means, however, is that you need to make sure that you have a fast and stable internet connection for downloading, and ideally wired Ethernet rather than wireless. Check your data plan too in case you have a data cap, or sneak the download at work. It was never that big a chore before, but ErgVideo 4.0 has simplified the hardware setup and check process even more. Upon starting up, the software automatically checks for all available sensors and trainers against the last configuration. If everything remains the same, you’re instantly good to go. Rider profiles are remembered, so you don't have to re-assign heart rate monitors or cadence sensors to the same rider each and every time. Here yellow means the trainer isn't on or the sensor isn't being received, while green means things are good. Under the "Who's Here" box you see my name because it sees my cadence sensor. Otherwise, you’re brought to a screen where you can match available sensors and rider profiles with a simple drag and drop interface. In our small training space, I've set myself up on the Kickr while my wife is on the CompuTrainer, and there's been no interference or problems with them or with our different heart rate sensors. Where ErgVideo really shines is their ease of use, both pre-ride and during the ride itself. In most cases, after opening the program, you’re ready to ride in three quick clicks. For Wahoo riders, no extra hardware is needed to control the action, as simple on-screen click buttons enable ramping FTP up or down in real-time, along with another button for performing a Wahoo spindown calibration. 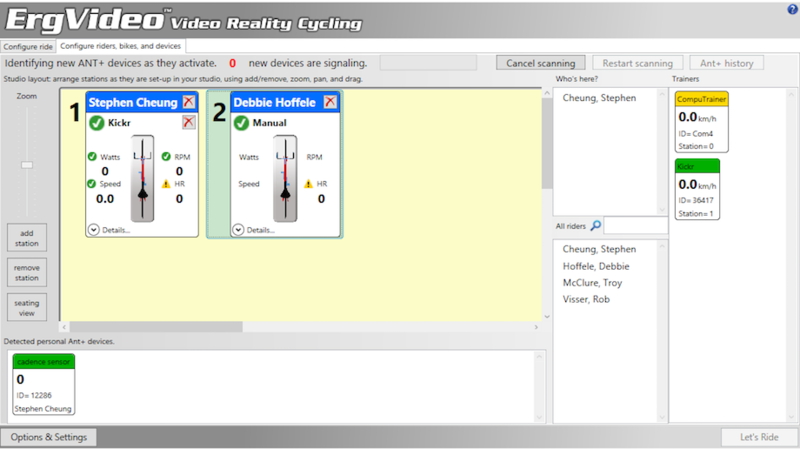 For CompuTrainer users, the head unit remains the tool for real-time FTP adjustment and calibration. The "basic" complete Alpe d'Huez ride with no alterations. Ride design remains superbly versatile. Besides the range of pre-built workouts for each video, you or your coach can customize a workout to your heart’s desire, from duration, number and intensity of the efforts, duration and intensity of recovery. I took me < 2 minutes to put together this alternate interval workout from scratch using the Alpe d'Huez video. 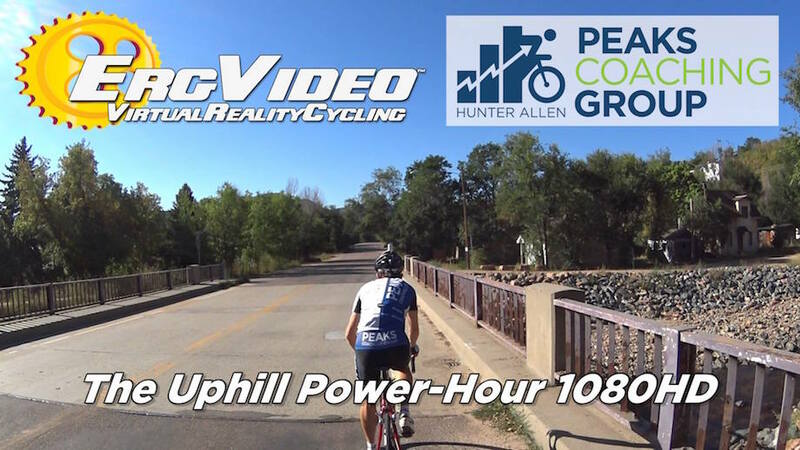 So a single climbing video like Alpe d’Huez 1080 can be ridden at a very easy endurance pace or at full intensity, and can even be built as an interval session as I've done here. This means that you get huge versatility from a single video. 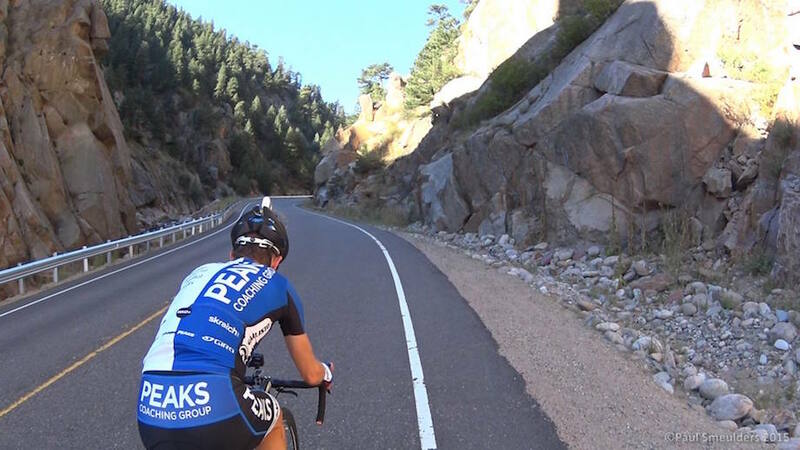 ErgVideo also renews its collaboration with Peaks Coaching Group with their new 1080p HD series of 4 videos featuring master coach (and Pez Toolbox contributor) Tim Cusick along with US cycling legend Scott “The Iceman” Moninger. Judging from personal experience hanging onto Scott's wheel for dear life, this photo is pretty lifelike, as I don't recall seeing Scott ever needing to use his mouth to breathe while riding. Master Coach Tim Cusick (L) helped develop the videos and also the accompanying free training plans. With 275 victories in his career, including multiple wins up Mount Evans and in stage races like Cascade Classic, it’s probably not a huge surprise that the series has a primary focus on climbing, both through building threshold power and also climbing-specific efforts. They thus complement the previous Hunter Allen Power Training series, where the focus was on threshold power and base strength/skill work. The wind-ups are great for strength building and rapid accelerations, while the paceline rides really feels like a paceline, with changing intensities as you rotate through. The latter is a great way to get in lots of tempo, sweet spot, or FTP work without the drudgery of pounding one constant wattage. It’s also great for keeping race rhythm and for TTT practice. Most coaches and athletes will know this as a bread-and-butter staple workout for building FTP and overall fitness. It features bursts of hard effort and then dropping right back into a tempo sweet spot effort, really forcing you to clear the lactate efficiently. Bread and butter climbing workout that you can customize the intensity to make it a tempo, sweet spot, or threshold effort. These very short but intense intervals of 40 s with 20 s recovery simulates the hard bursts you need for sudden changes in gradient or when your “friends” attack. They are also super for simulating race efforts. With the sweet spot effort at the end, note how I did as Tim suggested recently these intervals as cadence steps at 75, 85 and 95+ rpm. Not as easy as it may appear. 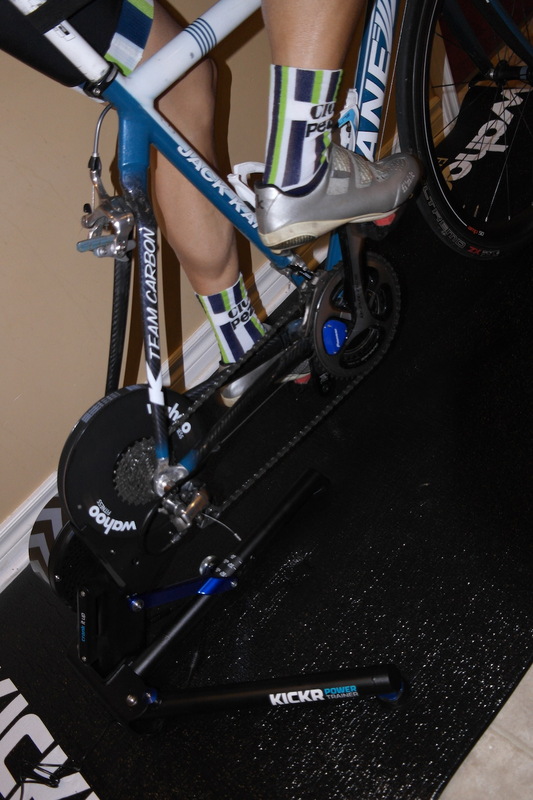 The ErgVideo system works with the CompuTrainer, Velotron, Wahoo Kickr and Snap trainers. You can replicate some of the workouts on your own using another trainer and especially if you have a power monitor. The ErgVideo 4.0 software runs on PC computers, and pretty much any relatively recent laptop or desktop running Windows 7, 8.1, and 10 should work. Minimum specs are 2GB RAM, 1 GB video, and enough hard drive space (or an external HD) for however many videos you own. 1. The Moninger-Allen Plan, featuring the 6 Hunter Allen & 4 Scott Moninger videos, plus several climbing videos. 2. The Moninger Plan, featuring the 4 Scott Moninger videos plus several climbing videos. 3. The Hunter Allen Power Plan, featuring the 6 Hunter Allen videos + 4 others (i.e., 10 are required to run the full training plan). 4. Training plan designed by Paul Smeulders, ErgVideo founder and NCCP Level 3 cycling coach. These use a wide range of existing ErgVideos. 5. Training plan designed by Paul Smeulders incorporating the 6 Hunter Allen Power Training videos plus a selection of others. Other customizable features include: whether you want 3, 4, or 5 workouts a week; the starting date; and whether you want easier adjustments to your endurance or interval workouts. Once set, these are built into your ErgVideo 4.0 software. So all you have to do is click on the workout scheduled for that date and ride! I have been on the Kickr with the new Scott Moninger videos since mid-November, and have to say that I’m quite enjoying them so far. There’s lots of variety amongst the videos and within the free plan, so it doesn’t get repetitive or boring. From initial assessment of the philosophy and purpose, the ErgVideo lineup gives you a super focus to your training, yet the quality and immersive nature of the videos gets you into the experience of riding rather than staring at numbers. And with their 1080p HD improvement and the new Moninger series, you can crank up your FTP and climbing ability this off-season and make 2016 your strongest year yet regardless of what cycling you’re aiming for.